A Wildcat lead against No. 25 Texas was as close as a bucket not once but three times down the final five-minute stretch of the game. That final basket would not be found, however, as the WIldcats dropped their home matchup 70-71 to the Longhorns, who are 18-10 and 9-6 in the Big 12. It is the 10th game of the season that the Wildcats have lost by 10 or less and the fourth game they have lost by five or less. The Wildcats are now 15-13 overall and 4-11 in Big 12 play, and they are 1-11 in games versus ranked teams this season. Senior guard Justin Edwards led all players with a career-high 20 points while junior forward D.J. Johnson and junior forward Wesley Iwundu also put up double digits with 16 and 12 points, respectively. The Wildcats trailed by as much as seven in the first half, with Texas shooting for a fairly high percentage early. For the first 13 minutes of the first half, Edwards and Johnson were K-State’s only scorers until two free throws by Iwundu cut Texas’ lead to two with 6:33 minutes to play in the half. After several Longhorn shooting slumps, K-State battled its way back with 3:49 minutes left in the first half. After getting up by three, two straight Texas buckets put the Longhorns back in front by two before a layup by junior guard Carlbe Ervin II tied it back up with nine seconds to play. Texas had the last word of the half, though, as Longhorn Kendal Yancy hit a 3-pointer to end the half and give his team the lead. 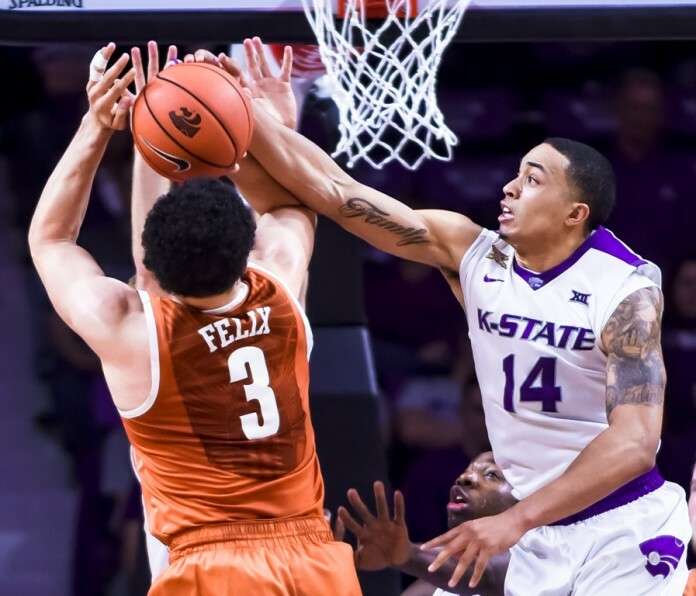 After the Longhorns grabbed their largest lead of the game with eight at the midway point of the second half, K-State found some offensive consistency. The Wildcats got it within four points twice, but the Longhorns responded each time from behind the arc to keep their lead. Texas went 5-12 in the second half from 3-point range, a stat that would haunt K-State all the way to the end of the game. The Wildcats cut the lead to two and had Iwundu at the line with a chance to tie it. Iwundu went one for two, leaving the Texas lead at one. Two straight shots for the Longhorns extended their lead to five. Edwards responded with a bucket and two free throws to get the lead back down to one. Junior Isaiah Taylor, who led the Longhorns in scoring with 19, nailed a 3-pointer with 43 seconds to play, giving Texas a two-possession lead once again. K-State wasted no time to score again as Iwundu laid in a quick layup, only wasting seven seconds off the clock. The Wildcats fouled Taylor on the ensuing possession and he hit both of his free throws. Freshman guard Barry Brown hit his only 3-pointer of the night and only the third 3 for any Wildcat in the game to once again cut the lead to one. Taylor was brought to the line one last time, but he missed the first of his one-and-one opportunity as K-State dribbled down the court with 20 seconds to retake the lead and most likely the game. A well-contested 3-pointer from freshman forward Dean Wade fell short, as did the Wildcats as the clocked ticked to zero. The loss was the Wildcats’ third straight at home. They have the week to rest up before heading to Ames, Iowa, to play No. 17 Iowa State on Saturday.